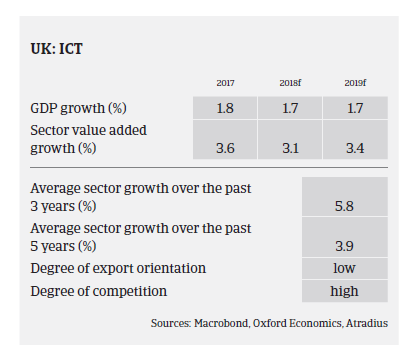 In 2017 the British ICT industry was worth more than GBP 97 billion, up 30% compared to 2012. However, increased uncertainty after the Brexit decision has resulted in lower market expansion. There are concerns that Brexit could hamper growth by creating a talent shortage and produce a wider skills gap. In 2017 demand for hardware products has continued its decline that began in 2014, as consumers are increasingly using their smartphones as their only computing device, cannibalising PC and laptop sales, while technological improvements are not sufficient to generate real growth in this segment. At the same time, software and data services remain the main drivers of ICT growth, together with cloud computing and the Internet of Things. Data centres, cloud computing and the continued development of mobile apps and new technology (e.g. wearable technology) are the areas that are anticipated to drive the sector forward in the coming years. 2017 was a record year for ICT-related investments in the UK, with significant contributions from Amazon, Apple and Google. British tech firms (including ICT) attracted more venture capital funding than any other European country in 2017, despite the looming uncertainty caused by the Brexit decision. That said, this uncertainty is one of the reasons why UK businesses turned to be less willing to commit to long-term IT projects, with budgets being revised, plans postponed and non-essential upgrades being delayed. This had an negative effect on the already low margins of many ICT businesses, especially in the ICT retailers segment. Pressure on margins also rose last year as input costs increased due to the pound Sterling depreciation, reducing the purchasing power of many ICT companies that are importing/purchasing in EUR/USD and selling in GBP. That said, the recovery of the exchange rate in recent months and a rather stable economic outlook for 2018 should help the ICT industry in the short-term. Adopting appropriate hedging mechanisms is vital for businesses to limit their risk exposure. On average, payments in the British ICT sector take around 60 days. Payment experience has remained good so far, and the level of protracted payments remains low. The number of non-payment cases has not increased in the last 12 months, and this positive trend is expected to continue. The level of ICT insolvencies is average, and no substantial increase is foreseen for 2018. However, competition continues to be fierce and businesses’ margins are expected to remain under pressure, with minimal barriers to entry. 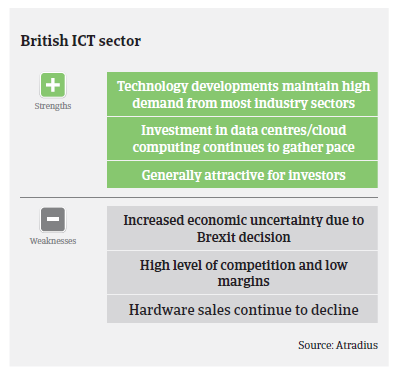 For the time being, our underwriting stance for the British ICT sector remains open. That said, given the current economic conditions, we focus our discussions with buyers around foreign exchange hedging mechanisms/techniques adopted to ensure they are sufficiently covered, as many companies have not faced this risk over the past couple of years. We are also closely monitoring ICT suppliers to the financial services sector, which is a major market for ICT sales in the UK. The potential relocation of financial institutions to mainland Europe in the wake of Brexit could have have a knock-on effect on ICT suppliers. While the British government has sought to reassure major finance firms that the industry would be protected in a Brexit trade deal, the real outcome remains to be seen.